Welcome to Lakeside RV Park! Enjoy the peaceful, natural setting and our stocked fishing pond. Take advantage of our three large, clean laundry rooms. Enjoy our renovated bathroom facilities. We have 3 separate bath houses for men & women. We have over 150 spaces to accommodate most vehicles. Our landscaped grounds include foot paths, a children’s playground, paved sites, and a beautiful fishing lake stocked yearly. Welcome to Lakeside RV Park! -- Stay with us long term! 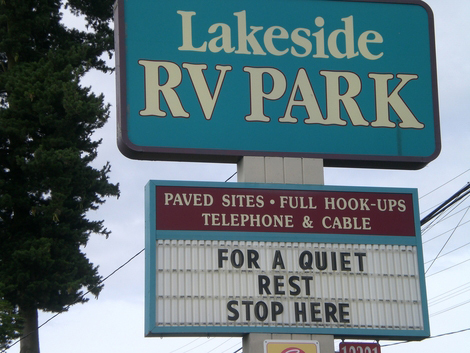 Lakeside RV Park is currently taking long-term reservations for RVs that are ten years old or newer. Call or email us now to make your reservation while space is still available! I visited Lakeside this past summer asking about a long-term site for my 45-foot RV. While they did not have one at the time, Charise was happy to put my name on a waitlist and keep in touch. She has been very faithful to keep in touch and then called yesterday to say they have site for me. They kept their promise to call me and I will always speak highly of them for their diligence. I had nothing but excellent experiences. Debby worked magic to get us accommodated over the holiday and for the length of time we needed. The rate is the LOWEST out of all the parks, showers were excellent. You will not find a nicer RV park in Everett. It is well managed and maintained. Bathrooms and laundry facilities are very clean. The park has easy access to Interstate 5, shopping and dining. This is an older park, built on a sloping hill. It is not just a "parking lot". Sites are close for modern day expandable RV's but have privacy shrubs. There is ample room to navigate and park. Many of the residents are on temporary work assignments with Boeing. Few if any children, and pets are not allowed to be a nuisance. We camped here in a Travel Trailer.